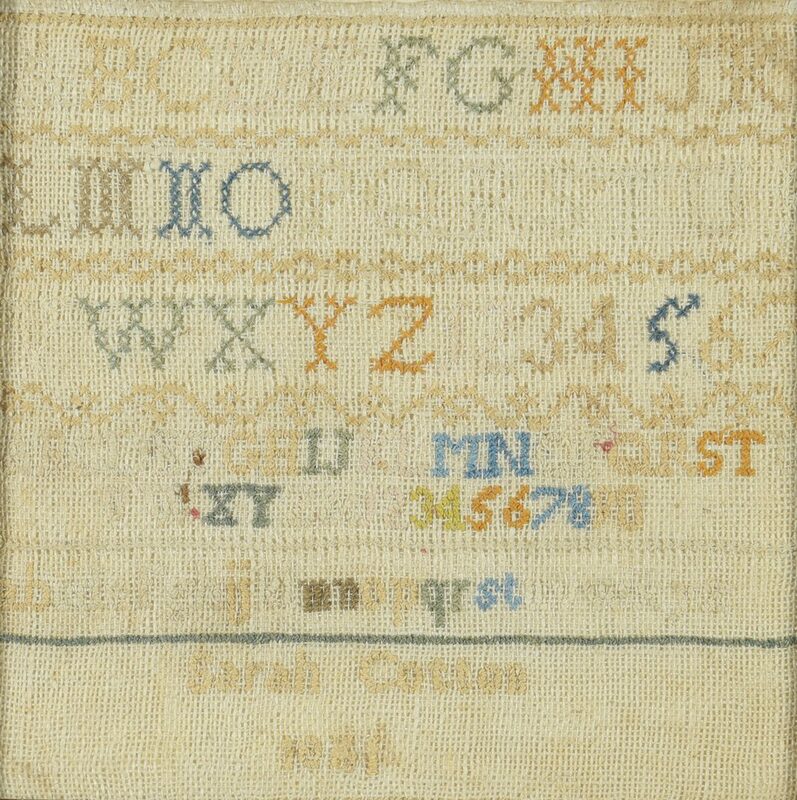 Needlework sampler, silk and/or cotton cross stitch on linen, with 3 alphabets and 2 rows of numbers, Signed at bottom Sarah Cotton and dated 1861. Original stained wood frame with replaced backing. 10" x 10". Accompanied by a file of genealogy information on the sitter, Sarah Jane Cotton of Williamson County, Tennessee, born 1853 to William Henry Cotton and Martha Jane Ballard Cotton. 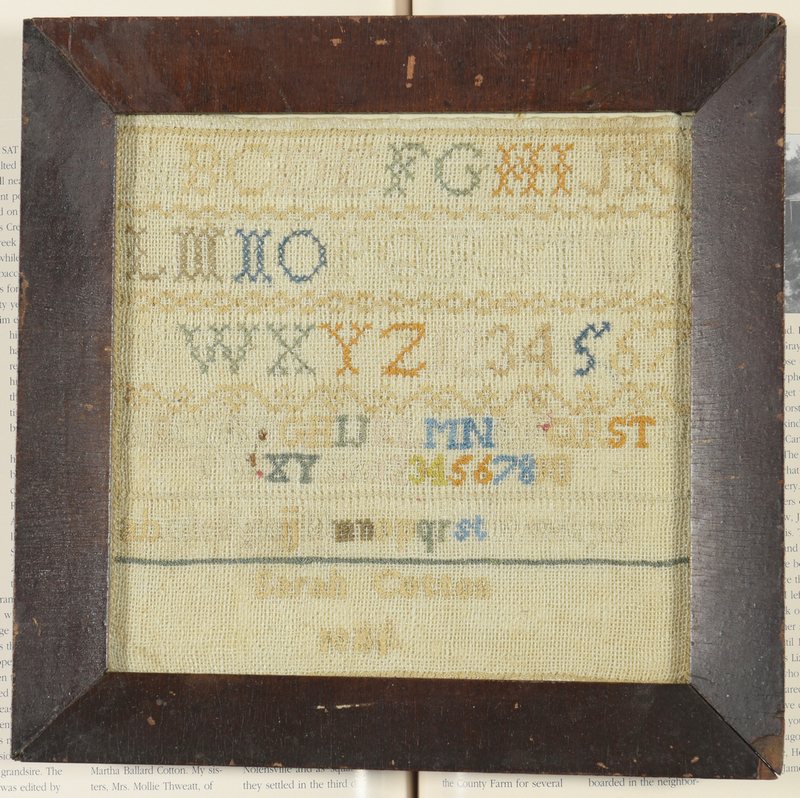 The sampler was apparently stitched the same year the Civil War began, and Sarah's father enlisted with the 11th (Holman's) Tennessee Cavalry, Company G, which saw action at the Battles of Franklin, Murfreesboro, Missionary Ridge, Lookout Mountain, and Atlanta. He survived; Sarah went on to marry George Bartlett Tucker in Williamson County in 1877. They had two children, and she died in 1916. She is buried in Mount Hope Cemetery in Franklin, Tennessee. Also included with this lot is a book, Leiper's Fork and Surrounding Communities by Rick Warwick, which mentions Sarah Cotton's family pp. 124-126. 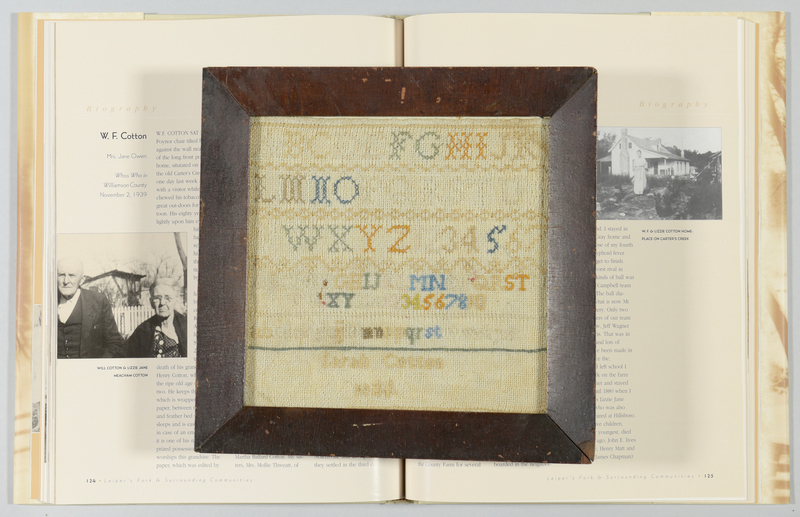 CONDITION: Light discoloration and uneven fading, some light staining at lower left and upper right corners, couple of small dark stains in lower left quadrant, no apparent thread loss.